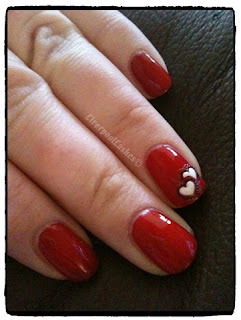 So todays post is just a quick one to show you my nails from last night. I wanted something simple for my friends wedding and the old romantic in me wanted to have a little subtle 'loved up' design - particularly because I always do things on my ring finger and since i'm married and watching someone else get married... it can sit on the same finger as my wedding rings (soppy eh?!) Anyway I did this and took a photo.. as I took the photo I smudged the little finger and then as I was getting ready I smudged one of the hearts (you know what its like when you're getting ready!) so as a last resort I dragged out the stickers for quickness. The ones I used are from Viva La Nails. I was technically sent these for free but I paid £2.95 postage. They did the job, easy to use and straight forward. I have to say that these particular stickers are 3D and have a rubber-like texture to them which I find REALLY annoying because whenever your nail brushes against anything it gives you that feeling of your nail polish smudging!! eeeek!! 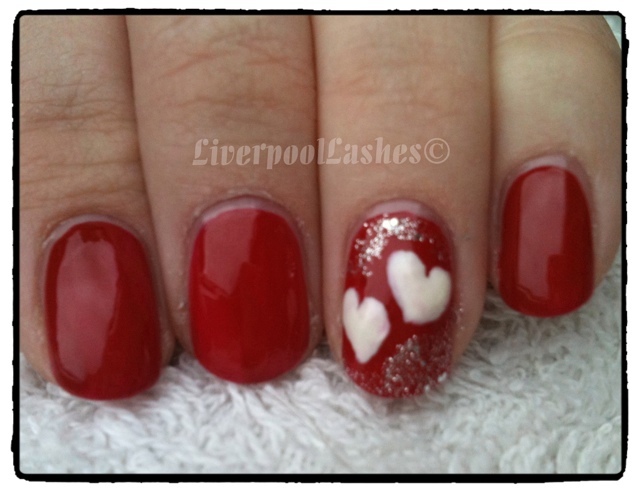 The perfectionist in me also didn't like the way you could see the clear section around the rim of the sticker so anyone who sees your nails will be in no doubt that you used a sticker !! 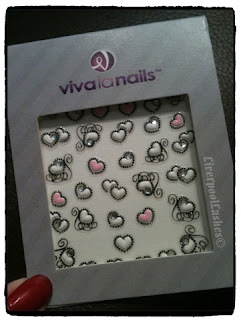 If you've tried or regularly use nail stickers - let me know what you think.